Throughout its history, the Royal Marines have seen action in a number of major wars often fighting beside the British Army – including the Seven Years' War, the Napoleonic Wars, the Crimean War, World War I and World War II. In recent times the Corps has been largely deployed in expeditionary warfare roles such as the Falklands War, the Gulf War, the Bosnian War, the Kosovo War, the Sierra Leone Civil War, the Iraq War and the War in Afghanistan. The Royal Marines have close international ties with allied marine forces, particularly the United States Marine Corps and the Netherlands Marine Corps (Dutch: Korps Mariniers). Today, the Royal Marines are an elite fighting force within the British Armed forces, having undergone many substantial changes over time. The Royal Marines traces its origins back to 28 October 1664 when at the grounds of the Honourable Artillery Company "the Duke of York and Albany's maritime regiment of foot" was first formed. On 5 April 1755, His Majesty's Marine Forces, fifty Companies in three Divisions, headquartered at Chatham, Portsmouth, and Plymouth, were formed by Order of Council under Admiralty control. Initially all field officers were Royal Navy officers as the Royal Navy felt that the ranks of Marine field officers were largely honorary. This meant that the furthest a Marine officer could advance was to lieutenant colonel. It was not until 1771 that the first Marine was promoted to colonel. This attitude persisted well into the 1800s. During the rest of the 18th century, they served in numerous landings all over the world, the most famous being the landing at Belle Île on the Brittany coast in 1761. They also served in the American War of Independence, notably in the Battle of Bunker Hill led by Major John Pitcairn. In 1788 a detachment of four companies of marines, under Major Robert Ross, accompanied the First Fleet to protect a new colony at Botany Bay (New South Wales). Due to an error the Fleet left Portsmouth without its main supply of ammunition, and were not resupplied until the Fleet docked in Rio de Janeiro midway through the voyage. Scholars such as Christopher Warren and Seth Carus argue that the Marines deliberately spread smallpox among Australia's indigenous population in order to protect the settlement and respond to an overwhelming strategic threat. This incident does not appear in contemporaneous Marine or government records. Major Ross lost his papers during the shipwreck of HMS Sirius. Some researchers associate the indigenous smallpox outbreak with other causes. In 1802, largely at the instigation of Admiral the Earl St Vincent, they were titled the Royal Marines by King George III. The Royal Marines Artillery (RMA) was formed as a separate unit in 1804 to man the artillery in bomb ketches. These had been manned by the Army's Royal Regiment of Artillery, but a lawsuit by a Royal Artillery officer resulted in a court decision that Army officers were not subject to Naval orders. As RMA uniforms were the blue of the Royal Regiment of Artillery they were nicknamed the "Blue Marines" and the infantry element, who wore the scarlet uniforms of the British infantry, became known as the "Red Marines", often given the semi-derogatory nickname "Lobsters" by sailors. A fourth division of the Royal Marines, headquartered at Woolwich, was formed in 1805. 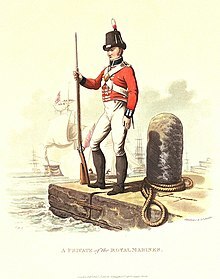 During the Napoleonic Wars the Royal Marines participated in every notable naval battle on board the Royal Navy's ships and also took part in multiple amphibious actions. Marines had a dual function aboard ships of the Royal Navy in this period; routinely, they ensured the security of the ship's officers and supported their maintenance of discipline in the ship's crew, and in battle, they engaged the enemy's crews, whether firing from positions on their own ship, or fighting in boarding actions. In the Caribbean theatre volunteers from freed French slaves on Marie-Galante were used to form Sir Alexander Cochrane's first Corps of Colonial Marines. These men bolstered the ranks, helping the British to hold the island until reinforcements arrived. This practice was repeated during the War of 1812, where escaped American slaves were formed into Cochrane's second Corps of Colonial Marines. These men were commanded by Royal Marines officers and fought alongside their regular Royal Marines counterparts at the Battle of Bladensburg. Throughout the war Royal Marines units raided up and down the east coast of America including up the Penobscot River and in the Chesapeake Bay. They fought in the Battle of New Orleans and later helped capture Fort Bowyer in Mobile Bay in what was the last action of the war. In 1855 the infantry forces were renamed the Royal Marines Light Infantry (RMLI). During the Crimean War in 1854 and 1855, three Royal Marines earned the Victoria Cross, two in the Crimea and one in the Baltic. In 1862 the name was slightly altered to Royal Marine Light Infantry. The Royal Navy did not fight any other ships after 1850 and became interested in landings by Naval Brigades. In these Naval Brigades, the function of the Royal Marines was to land first and act as skimishers ahead of the sailor infantry and artillery. This skirmishing was the traditional function of light infantry. For most of their history, British Marines had been organised as fusiliers. In the rest of the 19th Century the Royal Marines served in many landings especially in the First and Second Opium Wars (1839–1842 and 1856–1860) against the Chinese. These were all successful except for the landing at the Mouth of the Peiho in 1859, where Admiral Sir James Hope ordered a landing across extensive mud flats. The Royal Marines also played a prominent role in the Boxer Rebellion in China (1900), where a Royal Marine earned a Victoria Cross. Pursuing a career in the Marines had been considered social suicide through much of the 18th and 19th centuries since Marine officers had a lower standing than their counterparts in the Royal Navy. A short-lived effort was made in 1907, through the common entry or "Selborne Scheme", to reduce the professional differences between RN and RM officers through a system of common entry that provided for an initial period of shared training. During the First World War, in addition to their usual stations aboard ship, Royal Marines were part of the Royal Naval Division which landed in Belgium in 1914 to help defend Antwerp and later took part in the amphibious landing at Gallipoli in 1915. It also served on the Western Front. The Division's first two commanders were Royal Marine Artillery Generals. Other Royal Marines acted as landing parties in the Naval campaign against the Turkish fortifications in the Dardanelles before the Gallipoli landing. They were sent ashore to assess damage to Turkish fortifications after bombardment by British and French ships and, if necessary, to complete their destruction. The Royal Marines were the last to leave Gallipoli, replacing both British and French troops in a neatly planned and executed withdrawal from the beaches. The Royal Marines also took part in the Zeebrugge Raid in 1918. Five Royal Marines earned the Victoria Cross in the First World War, two at Zeebrugge, one at Gallipoli, one at Jutland and one on the Western Front. After the war Royal Marines took part in the allied intervention in Russia. In 1919, the 6th Battalion RMLI mutinied and was disbanded at Murmansk. The Royal Marine Artillery (RMA) and Royal Marine Light Infantry (RMLI) were amalgamated on 22 June 1923. Post-war demobilisation had seen the Royal Marines reduced from 55,000 (1918) to 15,000 in 1922 and there was Treasury pressure for a further reduction to 6,000 or even the entire disbandment of the Corps. As a compromise an establishment of 9,500 was settled upon but this meant that two separate branches could no longer be maintained. The abandonment of the Marine's artillery role meant that the Corps would subsequently have to rely on Royal Artillery support when ashore, that the title of Royal Marines would apply to the entire Corps and that only a few specialists would now receive gunnery training. As a form of consolation the dark blue and red uniform of the Royal Marine Artillery now became the full dress of the entire Corps. Royal Marine officers and SNCO's however continue to wear the historic scarlet in mess dress to the present day. The ranks of private, used by the RMLI, and gunner, used by the RMA, were abolished and replaced by the rank of Marine. 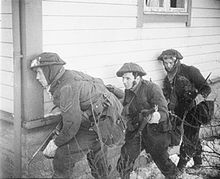 During the Second World War, a small party of Royal Marines were first ashore at Namsos in April 1940, seizing the approaches to the Norwegian town preparatory to a landing by the British Army two days later. The Royal Marines formed the Royal Marine Division as an amphibiously trained division, parts of which served at Dakar and in the capture of Madagascar. After the assault on the French naval base at Antsirane in Madagascar was held up, fifty Sea Service Royal Marines from HMS Ramilles commanded by Captain Martin Price were landed on the quay of the base by the British destroyer HMS Anthony after it ran the gauntlet of French shore batteries defending Diego Suarez Bay. They then captured two of the batteries, which led to a quick surrender by the French. In addition the Royal Marines formed Mobile Naval Base Defence Organisations (MNBDOs) similar to the United States Marine Corps Defense Battalions. One of these took part in the defence of Crete. Royal Marines also served in Malaya and in Singapore, where due to losses they were joined with remnants of the 2nd Battalion, Argyll and Sutherland Highlanders to form the "Plymouth Argylls". The Royal Marines formed one Commando (A Commando) which served at Dieppe. One month after Dieppe, most of the 11th Royal Marine Battalion was killed or captured in an ill staged amphibious landing at Tobruk in Operation Agreement. Again, the Marines were involved with the Argyll and Sutherland Highlanders, this time the 1st Battalion. In 1942 the Infantry Battalions of the Royal Marine Division were re-organised as Commandos, joining the British Army Commandos. The Division command structure became a Special Service Brigade command. The support troops became landing craft crew and saw extensive action on D-Day in June 1944. A total of four Special Service Brigades (later Commando brigade) were raised during the war, and Royal Marines were represented in all of them. A total of nine RM Commandos (Battalions) were raised during the war, numbered from 40 to 48. 1 Commando Brigade had just one RM Battalion, No 45 Commando. 2 Commando Brigade had two RM battalions, Nos 40 and 43 Commandos. 3 Commando Brigade also had two, Nos 42 and 44 Commandos. 4 Commando Brigade was entirely Royal Marine after March 1944, comprising Nos 41, 46, 47 and 48 Commandos. 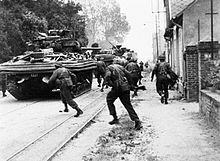 1 Commando Brigade took part in first in the Tunisia Campaign and then assaults on Sicily and Normandy, campaigns in the Rhineland and crossing the Rhine. 2 Commando Brigade was involved in the Salerno landings, Anzio, Comacchio, and operations in the Argenta Gap. 3 Commando Brigade served in Sicily and Burma. 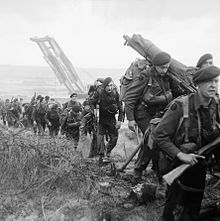 4 Commando Brigade served in the Battle of Normandy and in the Battle of the Scheldt on the island of Walcheren during the clearing of Antwerp. In January 1945, two further RM Brigades were formed, 116th Brigade and 117th Brigade. Both were conventional Infantry, rather than in the Commando role. 116th Brigade saw some action in the Netherlands, but 117th Brigade was hardly used operationally. In addition one Landing Craft Assault (LCA) unit was stationed in Australia late in the war as a training unit. In 1946 the Army Commandos were disbanded, leaving the Royal Marines to continue the Commando role (with supporting Army elements). A number of Royal Marines served as pilots during the Second World War. It was a Royal Marines officer who led the attack by a formation of Blackburn Skuas that sank the Königsberg. Eighteen Royal Marines commanded Fleet Air Arm squadrons during the course of the war, and with the formation of the British Pacific Fleet were well-represented in the final drive on Japan. Captains and Majors generally commanded squadrons, whilst in one case Lt Colonel R.C. Hay on HMS Indefatigable was Air Group Co-ordinator from HMS Victorious of the entire British Pacific Fleet. Throughout the war Royal Marines continued in their traditional role of providing ships detachments and manning a proportion of the guns on Cruisers and Capital Ships. They also provided the crew for the UK's Minor Landing craft, and the Royal Marines Armoured Support Group manned Centaur IV tanks on D Day; one of these is still on display at Pegasus Bridge. Only one Marine (Corporal Thomas Peck Hunter of 43 Commando) was awarded the Victoria Cross in the Second World War for action at Lake Comacchio in Italy. Hunter was the most recent RM Commando to be awarded the medal. The Royal Marines Boom Patrol Detachment under Blondie Haslar carried out Operation Frankton and provided the basis for the post-war continuation of the SBS. The Corps underwent a notable change after 1945 however, when the Royal Marines took on the main responsibility for the role and training of the British Commandos. The Royal Marines have an illustrious history, and since their creation in 1942 Royal Marines Commandos have engaged on active operations across the globe, every year, except 1968. Notably they were the first ever military unit to perform an air assault insertion by helicopter, during the Suez Crisis in 1956. They were also part of the land element during the 1982 Falklands War. The Royal Marines are part of the Naval Service and under the full command of Fleet Commander. The rank structure of the corps is similar to that of the British Army with officers and other ranks recruited and initially trained separately from other naval personnel. Since 2017 women have been able to serve in all roles in the Royal Marines. On average, 1,200 recruits attend training courses at the Commando Training Centre Royal Marines every year. At its height in 1944 during the Second World War, more than 70,000 people served in the Royal Marines. Following the Allied victory the Royal Marines were quickly reduced to a post-war strength of 13,000. When National Service finally came to an end in 1960, the Marines were again reduced, but this time to an all Commando-trained force of 9,000 personnel. As of October 2014 the Royal Marines had a strength of 7,760 Regular and 750 Royal Marines Reserve, giving a combined component strength of around 8,510 personnel. The Royal Marines are the only European marine force capable of conducting amphibious operations at brigade level. Infantry The basic infantry weapon of the Royal Marines is the L85A2 assault rifle, sometimes fitted with the L123A3 underslung grenade launcher. Support fire is provided by the L110A1 light machine gun, the L7A2 General Purpose Machine Gun (GPMG) and the L111A1 heavy machine gun (which is often mounted on an armoured vehicle); indirect fire by the L16A2 81mm mortar. 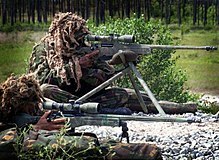 Sniper rifles used include the L115A3, produced by Accuracy International. More recently the L129A1 has come into service as the designated marksman rifle. Other weapons include the Javelin Anti-Tank missile, the L131A1 pistol and the Fairbairn-Sykes Fighting Knife. Armour The Royal Marines maintain no heavy armoured units, instead, they operate a fleet of lightly armoured and highly mobile vehicles intended for amphibious landings or rapid deployment. The primary armoured fighting vehicle operated by the Armoured Support Group is the BvS 10 Viking All Terrain Armoured Vehicle. Other, lighter vehicles include the Land Rover Wolf Armoured Patrol Vehicle, the Jackal (MWMIK) Armoured Vehicle and the Pinzgauer High Mobility All Terrain Vehicle. Artillery Field artillery support is provided by 29th Commando Regiment Royal Artillery of the British Army using the L118 Light Gun, a 105 mm towed howitzer. The regiment is Commando-trained. Aviation The Commando Helicopter Force of the Fleet Air Arm provides transport helicopters in support of the Royal Marines. It currently uses both Merlin HC4/4A medium-lift transport and Wildcat AH1 attack helicopters to provide direct aviation support for the Corps. 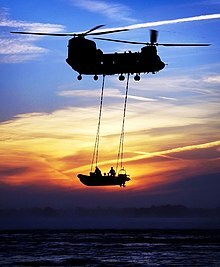 In addition, the Royal Air Force provides Chinook heavy-lift and Puma HC2 medium-lift transport helicopters. Vessels The Royal Marines operate a varied fleet of military watercraft designed to transport troops and material from ship to shore or conduct river or estuary patrols. These include the 2000TDX Landing Craft Air Cushion, the Mk10 Landing Craft Utility, the Mk5 Landing Craft Vehicle Personnel and the SDV Mk8 Mod 1 Swimmer Delivery Vehicle for special forces. Other smaller amphibious craft such as the Offshore Raiding Craft, Rigid Raider and Inflatable Raiding Craft are in service in much greater numbers. The overall head of the Royal Marines is Her Majesty Queen Elizabeth II, in her role as Commander-in-Chief of the British Armed Forces. The ceremonial head of the Royal Marines is the Captain General Royal Marines (equivalent to the Colonel-in-Chief of a British Army regiment). The current Captain-General is Prince Harry, Duke of Sussex. Full Command of the Royal Marines is vested in the Fleet Commander (FLTCDR) with the Commandant General Royal Marines, a major-general, embedded within the Navy Command Headquarters (NCHQ) as Commander UK Amphibious Force (COMUKAMPHIBFOR). With the exception of the 43 Commando Fleet Protection Group and Commando Logistic Regiment, which are each commanded by a full colonel, each of these units is commanded by a lieutenant-colonel of the Royal Marines, who may have sub-specialised in a number of ways throughout their career. Operational command of the five commandos and the Commando Logistics Regiment is delegated to 3 Commando Brigade Royal Marines, of which they are a part. Based at Stonehouse Barracks, the brigade exercises control as directed by either CINCFLEET or the Permanent Joint Headquarters. As the main combat formation of the Royal Marines, the brigade has its own organic capability to it in the field, 30 Commando Information Exploitation Group, a battalion sized formation providing information operations capabilities, life support and security for the Brigade Headquarters. 43 Commando Fleet Protection Group Royal Marines, responsible for the security of the United Kingdom's nuclear deterrent and other security-related duties was originally outside the brigade however from April 2012 it moved into it. It also provides specialist boarding parties and snipers for the Royal Navy worldwide, for roles such as embargo enforcement, counter-narcotics, counter-piracy and counter-insurgency activities of the Royal Navy. It is the largest unit in the brigade, at 790 strong. In general a rifle company Marine will be a member of a four-man fire team, the building block of commando operations. A Royal Marine works with their team in the field and shares accommodation if living in barracks. This structure is a recent development, formerly Commandos were structured similarly to British Army light Infantry Battalions. Formerly known as the Amphibious Ready Group, the Amphibious Task Group (or ATG) is a mobile, balanced amphibious warfare force, based on a Commando Group and its supporting assets, that can be kept at high readiness to deploy into an area of operations. The ATG is normally based around specialist amphibious ships, most notably HMS Ocean, the largest ship in the British fleet. Ocean was designed and built to accommodate an embarked commando and its associated stores and equipment. The strategy of the ATG is to wait "beyond the horizon" and then deploy swiftly as directed by HM Government. The whole amphibious force is intended to be self-sustaining and capable of operating without host-nation support. The concept was successfully tested in operations in Sierra Leone. The Commando Helicopter Force (CHF) forms part of the Fleet Air Arm. It comprises three helicopter squadrons and is commanded by the Joint Helicopter Command. It consists of both Royal Navy (RN) and Royal Marines personnel. RN personnel need not be commando trained. The CHF is neither under the permanent control of 3 Commando Brigade nor that of the Commandant General Royal Marines, but rather is allocated to support Royal Marines units as required. It uses both Merlin HC4/4A medium-lift and Wildcat AH1 light transport/reconnaissance helicopters to provide aviation support for the Royal Marines. On 11 April 2017 the First Sea Lord, Admiral Sir Philip Jones, announced that the Royal Marines were to be restructured. The Royal Marines will be able to deploy a specialist Maritime Operations Commando from the three combat units as part of the Commando Forces 2030 strategy. Royal Marines are required to undergo one of the longest and most physically demanding specialist infantry training regimes in the world. Recruit training lasts for 32 weeks for Marines and 60 weeks for officers. Potential recruits must be aged 16 to 32 (18 to 25 for Commissioned Officers) and must undertake a series of interviews, medical tests, an eye/sight test, psychometric tests and a PJFT (Pre-joining fitness test). As of late 2018 there is no restriction on women joining the Royal Marines. Once a potential recruit passes these, enlisted recruits undertake a 3-day selection course called PRMC (Potential Royal Marine Course) and potential officers undertake POC (Potential Officer Course) – both take place at the Commando Training Centre Royal Marines (CTCRM) in Lympstone, Devon. Officers must also take the Admiralty Interview Board (AIB). Upon passing the 3-day course, recruits then start basic recruit training (RT) at CTCRM. A large proportion of training is carried out on Dartmoor's inhospitable terrain and Woodbury Common woodland. Throughout the recruit training, Royal Marines learn and develop many military skills such as weapons handling, marksmanship and proficiency with different firearms, personal administration, marching and parade ground skills, map reading and navigation, physical fitness and mental toughness development, fieldcraft skills such as camouflage and stalking, basic survival techniques, patrolling and sentry duty development, unarmed and armed close quarters combat (CQC), first aid, underwater escape, chemical biological radiological nuclear (CBRN) training, military communications and signals, teamwork skills, amphibious landings training, and leadership skills for officers to name a few. The best recruit to finish training is awarded the Kings Badge. King George V directed that his Royal Cypher, surrounded by a laurel wreath, would be known as the King's Badge, and would be awarded to the best all round recruit in the King's Squad, provided that he was worthy of the honour. The badge was to be carried on the left shoulder, and worn in every rank. The King's Badge is not awarded to every squad, and is only presented if a recruit measures up to the very exacting standards required. Throughout their career, a Marine can specialise in a number of different roles upon completion of their respective courses after spending 1–2 years as a general duties (GD) Marine. Examples of some specialisations and different courses includes the mountain leader (ML), physical training instructor (PTI), Assault Engineer (AE), Royal Marines police (RMP), sniper (S), medical assistant (MA), pilot, reconnaissance operator (RO), drill instructor (DL), driver (D), clerk (C), signaller (SI), combat intelligence (CI), armourer (A), and heavy weapons (HW). Royal Marines can also apply for swimmer canoeist/Special Boat Service selection (SBS) or any other branch of the UKSF. All Royal Marines will also conduct training exercises on differing military skills on a regular basis including development in mountain, arctic, jungle, amphibious and desert warfare. They can also be involved in exchange training programs with other countries' forces – particularly the United States Marine Corps and the Netherlands Marine Corps/Korps Mariniers. The Royal Marines Museum (established in October 1958) is an institution dedicated to the history of the Royal Marines. In 2011, it became part of the National Museum of the Royal Navy, which has since been the executive public body of the museum in the Ministry of Defence. It will soon be moving from Eastney Barracks to Portsmouth Dockyard. The Royal Marines have a proud history and unique traditions. With the exceptions of "Gibraltar" and the laurel wreath for the Battle of Belle Island, their colours (flags) do not carry battle honours in the manner of the regiments of the British Army or of the US Marine Corps, but rather the "globe itself" as a symbol of the Corps. There are no other battle honours displayed on the colours of the four battalion-sized units of the current Corps. The Latin motto "Per Mare Per Terram" translates into English as "By Sea By Land". Believed to have been first used in 1775, this motto describes the Royal Marines ability in fighting both afloat on-board ships of the Royal Navy as well as ashore in their many land engagements. The fouled anchor, incorporated into the emblem in 1747, is the badge of the Lord High Admiral, and shows that the Corps is part of the Naval Service. The regimental quick march of the Corps is "A Life on the Ocean Wave", while the slow march is the march of the Preobrazhensky Regiment, awarded to the Corps by Admiral of the Fleet Earl Mountbatten of Burma on the occasion of the Corps's tercentenary in 1964. Lord Mountbatten was Life Colonel Commandant of the Royal Marines until his murder by the IRA in 1979. The Royal Marines are allowed by the Lord Mayor of the City of London to march through the City as a regiment in full array. This dates to the charter of Charles II that allowed recruiting parties of the Admiral's Regiment of 1664 to enter the City with drums beating and colours flying. The modern Royal Marines retain a number of distinctive uniform items. These include the green "Lovat" service dress worn with the green beret, the dark blue parade dress worn with either the white Wolseley Pattern Helmet (commonly referred to as "pith helmet") or white and red peaked cap, the scarlet and blue mess dress for officers and senior non-commissioned officers and the white hot-weather uniform of the Band Service. For historical information regarding Marine uniforms, see Uniforms of the Royal Marines. Early connections date from Balaclava in the Crimean War and Lucknow during the Indian Mutiny, but the main association stems from World War II. In July 1940, after the fall of Dunkirk, the 5th Battalion, Argyll and Sutherland Highlanders served with the Royal Marine Brigade for over a year. When the battleships HMS Prince of Wales and HMS Repulse were sunk in December 1941, the Royal Marines survivors joined up with the remnants of the 2nd Battalion, in the defence of Singapore. They formed what became known as 'The Plymouth Argylls', after the association football team, since both ships were Plymouth manned. Most of the Highlanders and Marines who survived the bitter fighting were taken prisoner by the Japanese. The Royal Marines inter-unit rugby football trophy is the 'Argyll Bowl', presented to the Corps by the Regiment in 1941. The fore-bearer regiments of the Princess of Wales's Royal Regiment, 31st (Huntingdonshire) Regiment of Foot was initially raised as amphibious troops. They served as Marines for a period. To this day one officer from the Royal Marines serves with the PWRR and Vice Versa. Also the Royal Marine Lanyard is worn by all ranks in Service Dress and Number 2 Dress uniform and barrack dress of PWRR. Close links have existed between the Royal Marines and the Barbados Defence Force since 1985 when a bond was established following a series of cross-training exercises in the Caribbean. The Alliance was approved by HM the Queen in 1992. The Royal Marines have close links with the Royal Netherlands Marine Corps, with whom they conduct NATO exercises throughout the year. Formed during the Anglo-Dutch Wars in 1665, the Dutch Marines distinguished themselves in raids on the English coast, where it is likely they met their future counterparts. Units of the Royal Netherlands Marine Corps work in close co-operation with 3 Commando Brigade of the Royal Marines. Operational units of the Royal Netherlands Marine Corps are fully integrated into this brigade. This integration is known as the United Kingdom-Netherlands Landing Force and is a component of the United Kingdom-Netherlands Amphibious Force as a key strike force during the Cold War to strengthen the Nordic area. The 9eme BIMa (9th Marine Infantry Brigade) is a Marine infantry brigade which is one of the two designated amphibious brigades in France. It is unique in being the only 'all Marine' Brigade in the French Army; the other amphibious brigade, 6eme Light Armoured Brigade, is composed of a mix of cap badges. 9 BIMa is also a light armoured brigade, formed of two Marine infantry regiments (2 and 3 Regiments d'Infanterie de Marine- 2/3 RIMa) and a tank battalion. 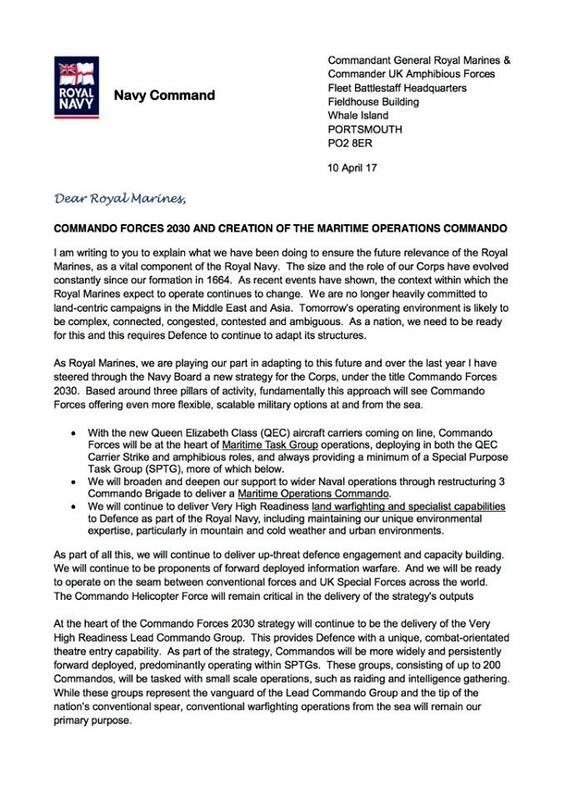 ^ "Supersession of the Commandant General Royal Marines". Royal Marines Charity. 19 January 2018. Retrieved 26 January 2018. ^ a b c d e f "Royal Marines History and Traditional Facts" (PDF). Marine Society & Sea Cadet. Archived (PDF) from the original on 5 July 2016. Retrieved 22 May 2016. ^ "Major John Pitcairn". Silverwhistle. Archived from the original on 30 January 2016. Retrieved 30 January 2015. ^ Warren Christopher (2013). "Smallpox at Sydney Cove – Who, When, Why". Journal of Australian Studies. 38: 68–86. doi:10.1080/14443058.2013.849750. ^ "Admiralty: Royal Marines, Woolwich Division: Correspondence, Registers and Papers". National Archives. Archived from the original on 13 April 2017. Retrieved 12 April 2017. ^ "Per Mare Per Terram – the Royal Marines 1793–1815". Napoleon Series. Archived from the original on 27 June 2015. Retrieved 30 January 2015. ^ "The Royal Marines in the War of 1812". Archived from the original on 30 September 2015. Retrieved 30 January 2015. ^ "The Battle of Fort Bowyer, Alabama". Explore Southern History. Archived from the original on 14 February 2015. Retrieved 30 January 2015. ^ "Second Anglo-Chinese War ("Opium war") of 1856 – 1860 (part 2)". William Loney. Archived from the original on 3 May 2012. Retrieved 30 January 2015. ^ Smith, Peter C. (1988). The Royal marines. p. 91. ISBN 978-0-946771-32-5. ^ "Class Warfare and the Selborne Scheme: The Royal Navy's battle over technology and social hierarchy". The Mariner's Mirror. 4 November 2014. Archived from the original on 2 January 2016. Retrieved 30 January 2015. ^ "The RMLI move to, and deployment at, Gallipoli". The Long, Long Trail. Archived from the original on 27 April 2015. Retrieved 30 January 2015. ^ "D-Day: Heroic battle in Port-en-Bessin". The Telegraph. 20 May 2009. Archived from the original on 13 June 2015. Retrieved 30 January 2015. ^ "Operation Infatuate". Combined Operations. Archived from the original on 6 February 2015. Retrieved 30 January 2015. ^ "Obituary:Colonel Ronnie Hay". The Telegraph. 24 December 2001. Archived from the original on 2 January 2016. Retrieved 30 January 2015. ^ Bingham, John (5 August 2008). "D-Day tanks found on seabed". The Telegraph. Archived from the original on 2 January 2016. Retrieved 30 January 2015. ^ "Remembering the secret mission of Cockleshell Heroes". BBC. 31 March 2011. Archived from the original on 2 January 2016. Retrieved 30 January 2015. ^ "History of RM deployments". Archived from the original on 7 March 2010. Retrieved 12 February 2010. ^ Simpson, Aislinn (14 April 2009). "The 22 Royal Marines who took on Argentine Falklands invasion force". The Telegraph. Archived from the original on 4 April 2015. Retrieved 30 January 2015. ^ "Royal Marines". British Army units 1945 on. Archived from the original on 5 June 2017. Retrieved 2 July 2017. ^ "Marine dies after illness at base". BBC. 3 November 2004. Retrieved 30 December 2017. ^ gov.uk MoD – Royal Navy & Royal Marines quarterly pocket brief Archived 29 November 2014 at the Wayback Machine, October 2014. See table 1. ^ a b "Royal Air Force Aircraft and Weapons page 44" (PDF). Royal Air Force. 2013. Archived from the original (PDF) on 10 July 2017. ^ a b c "Royal Air Force Aircraft and Weapons page 45" (PDF). Royal Air Force. 2013. Archived from the original (PDF) on 10 July 2017. ^ a b "Royal Air Force Aircraft and Weapons page 46" (PDF). Royal Air Force. 2013. Archived from the original (PDF) on 10 July 2017. ^ a b "Royal Air Force Aircraft and Weapons page 48" (PDF). Royal Air Force. 2013. Archived from the original (PDF) on 10 July 2017. ^ "Royal Air Force Aircraft and Weapons page 49" (PDF). Royal Air Force. 2013. Archived from the original (PDF) on 10 July 2017. ^ Fairbairn, W.E. (December 1996) . Get Tough (new ed.). Boulder, Colo.: Paladin Press. ISBN 978-0-87364-002-2. ^ IISS 2010, p. 168. ^ "29th Regiment RA". British Army units 1945 on. Archived from the original on 21 April 2014. Retrieved 10 May 2014. ^ a b "Commando Helicopter Force (CHF) | Royal Navy". www.royalnavy.mod.uk. Archived from the original on 31 August 2017. Retrieved 27 July 2017. ^ "Royal Marines - Landing Craft". Royal Navy. Archived from the original on 23 June 2014. Retrieved 15 June 2014. ^ "Prince Harry succeeds the Duke of Edinburgh as Captain General Royal Marines". Royal Navy. 19 December 2017. Archived from the original on 22 December 2017. Retrieved 19 December 2017. ^ "Senior Naval Staff". Archived from the original on 14 March 2009. As the Commander-in-Chief Fleet, a position he took up in November 2007, Mark Stanhope has full command of all deployable Fleet units, including the Royal Marines. ^ a b "3 Commando Brigade". Royal Navy. Archived from the original on 1 April 2016. Retrieved 4 April 2016. ^ "30 Commando Information Exploitation Group". Royal Navy. Archived from the original on 7 May 2010. Retrieved 2 June 2010. ^ "Bridge Card – 11 February 11" (PDF). Archived (PDF) from the original on 16 March 2011. Retrieved 21 April 2011. 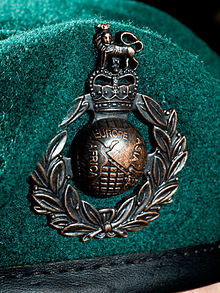 ^ a b "43 Commando resurrected as historic Royal Marines unit returns". Archived from the original on 4 April 2012. Retrieved 3 April 2012. ^ "Commando Helicopter Force webpage". Archived from the original on 24 June 2009. Retrieved 17 June 2009. ^ "Royal Marines to be restructured in line with growing Royal Navy". GOV.UK. 11 April 2017. Archived from the original on 15 April 2017. Retrieved 17 April 2017. ^ "Commando Forces 2020". Royal Navy. Archived from the original on 18 April 2017. Retrieved 17 April 2017. ^ "What Does It Take To Be A Royal Marine? Royal Navy Jobs". Royalnavy.mod.uk. Archived from the original on 29 January 2017. Retrieved 31 January 2017. ^ "Royal Marines to welcome first women recruits in 2019". Naval Today. Archived from the original on 12 April 2019. Retrieved 12 April 2019. ^ "Woodbury | information and guide to Woodbury Devon UK". Devonlink.co.uk. Archived from the original on 25 August 2012. Retrieved 20 November 2016. ^ "Royal Marines Commando Training". Royal Navy. Archived from the original on 31 December 2017. Retrieved 30 December 2017. ^ "Kings Squad". Royal Navy. Archived from the original on 24 November 2012. Retrieved 2 September 2014. ^ "Royal Marines Museum to be moved to new home in Portsmouth Historic Dockyard". Portsmouth News. 17 October 2013. Archived from the original on 11 June 2016. Retrieved 22 May 2016. ^ a b "The Royal Marines" (PDF). NATO. Archived (PDF) from the original on 22 December 2015. Retrieved 17 December 2015. ^ "The Capture of Gibraltar - 24 July 1704" (PDF). Royal Navy. Archived (PDF) from the original on 4 March 2016. Retrieved 17 December 2015. ^ "Sword presentation Royal Marine Corps at the Royal Marines Museum". Archived from the original on 22 December 2015. Retrieved 17 December 2015. ^ "Royal Marines". Archived from the original on 22 December 2015. Retrieved 17 December 2015. ^ "Helmet, Wolseley pattern (Tropical) S/P 1912 Royal Marines". Imperial War Museum. Archived from the original on 22 December 2015. Retrieved 17 December 2015. ^ "The East Surrey Regiment - Marine Service of the Regiment, War of the Spanish Succession". Queen's Royal Surreys. Archived from the original on 27 June 2016. Retrieved 24 February 2017. ^ "HMS Bulwark arrives in the Netherlands to mark amphibious pact". Royal Navy. 8 May 2013. Archived from the original on 17 November 2015. Retrieved 30 January 2015. ^ "Devon Royal Marines in French exercise". Ministry of Defence. 12 March 2013. Archived from the original on 25 February 2017. Retrieved 24 February 2017. Wikimedia Commons has media related to Royal Marines.